This patient in his early 40's presented with significant volume loss in his cheeks. This gave him a very sunken and drawn appearance, making him look very aged. This is the patient post fat transfer. By taking fat from one area in the body and carefully placing it into this patients cheeks, it has created a natural fullness. It has helped to soften the nasolabial fold. The before and after photographs on this page can help patients gain better insight into the fat transfer procedure. When you think about a fat transfer, it is difficult to imagine what influence fat can have on a certain area. 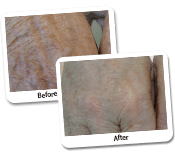 To help illustrate this, we provide numerous before and after photographs patients can refer to. Please note that the before and after photographs of the fat transfer are meant as examples, not results patients should expect for themselves. It is important to realise that every patient is unique, so the results obtained from a fat transfer will be unique too. 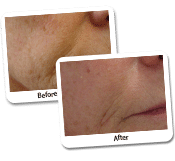 How Does The Face Age And How Does The Fat Transfer Help? There are a number of things which influence the rate of aging in our face. Over time, the fat pads in our cheeks will lose their fullness leaving a sunken, aged look. This can also be associated with a patient’s weight. Have you ever noticed how chubbier people look younger and healthier in the face than skinny people? This is because they have that volume in their cheeks which is associated with a youthful appearance. These fat pads in our cheeks seem to make their way down to our lower face, creating heavier jowls. The best way to combat these issues is by replacing that loss of volume with some sort of filler. Dr Lanzer has many years of experience in using dermal fillers to replace volume loss and in the last few years has been using patients own fat. He has seen such success in this area of ‘organic filling’ that he was the first in Australia to invest in the Cosmetic Fat Bank, whereby patients are able to have a liposuction procedure and store their fat for future re-injection in to whatever area of the body they chose for rejuvenation. Common areas include the cheeks, forehead, lips, neck, décolletage and backs of hands. Fat injections are not 100% guaranteed to take to the area they are put in to, which is why storing your fat is a great option so that you can come in for top ups when required or if you decide that you would like the fat also put somewhere else. Most dermal fillers only last for up to 2 years, whereas if the fat stem cells take to the area they are placed in, should stay long term. How Do I Book An Appointment For A Fat Transfer? To make an appointment for a fat transfer at The Dr Lanzer, simply give us a call during business hours. If you cannot contact us during that time, you can also book your appointment through the website contact form.